From organic reach to persuasive brand loyalty, the Coles Little Shop promotion ticks every single box on the marketer's dream wish list, argues Algo Mas' Julie Wrobel. My 19-month-old twins are too young to care about Coles Little Shop, although we’ve still been caught up in the craze. So why is Little Shop one of the greatest retail marketing campaigns ever? The campaign is aimed at children but let’s be honest, what parent doesn’t get a buzz from unwrapping a Little Shop packet to find a coveted mini Oak inside? So while our kids encourage us to shop at Coles, it’s an easy sell as we want to complete the set just as much as they do. Last week I purchased two Snickers bars at the Coles check-out to increase my $57.80 shop to over $60 so I’d be eligible for two Little Shop packets instead of one. I don’t even like Snickers. As well as the Coles Little Shop minis there’s an extended product range of Little Shop Accessories including a Collector’s Case and Coles trolley (all branded of course), most of which sold out early in the campaign and are being hawked on eBay for $100 plus. These Coles accessories and minis are now in doll houses and our kids’ pretend play is peppered with Coles branded free range eggs. Children are apparently exposed to between 500 and a whopping 5,000 brand messages a day. Coles figured out a way to create brand loyalty right there in little Sally’s play room, even when the TV and iPad are off. Marketers often talk about organic marketing, the act of growing customers and brand recognition without paid advertising. 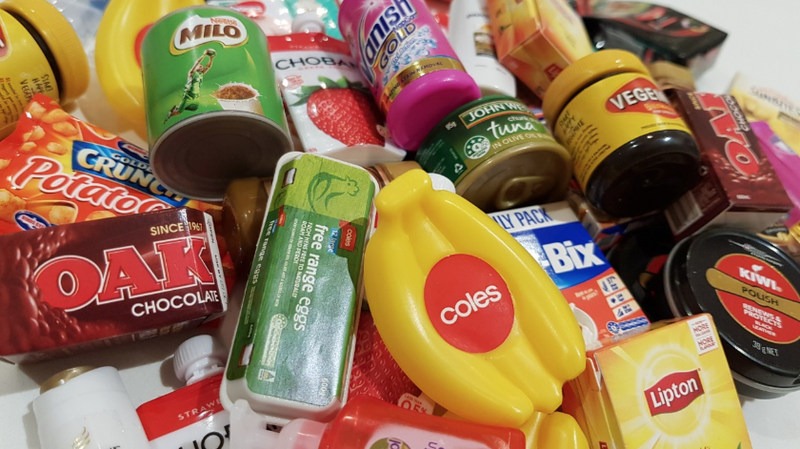 The Coles Little Shop campaign has created, organically, a secondary market of swap meets and recess time trade-offs, extending the campaign’s reach. Families are rallying together to collect full sets for the grandkids. Gumtree gurus are cashing in selling complete sets for up to $1000 and at least 20 Coles Little Shop Facebook groups have been created, one has 22,000 members. A search for “Coles Little Shop” in Google returned over 702,000 results. Despite the backlash against the unnecessary plastic packaging and the ethics of promoting brands to three-year-olds, who for some reason will now only eat John West tuna (sorry Sirena), the campaign has been a huge success, with Woolworths recently blaming Coles Little Shop as a reason for poor 2019 Q1 sales. Oh, and if anyone has a spare Nutella, I have plenty of Weet-Bix, Chobani and bananas to trade… email me at juliew@algomas.com.au. Julie Wrobel is the managing director of branding and communications studio, Algo Mas. This piece first appeared here. I agree, a genuinely brilliant idea from Coles. The couple of incremental items into the baskets of mum and dads makes a huge difference at results time. I live in a one bedroom apartment in inner Sydney’s Surry Hills. The Little Shop products are just the right size for my kitchen. Please don’t discontinue them. Genuine LOL at that comment. Presume the author was unaware of the small matter of the single use plastic ban at the exact time, and the huge amount of negative publicity surrounding this promotion? Should have been made from recycled plastic bags. Yeah I stopped shopping at Coles or any place owned by Coles the day the Little Shop products came out. It’s beyond disingenuous to release these at the same time as withdrawing single-use plastic bags. I’d recommend the person who wrote this go check out the Australian documentary ‘Blue’ and then tell me they’re still super excited about these plastic toys. Your kids definitely don’t know better but you should. I’m sure they will enjoy having more plastic in their oceans than fish though. And those kids’ “pretend play” involves a miniature toy pretend bottle of bleach. What could go wrong? Well done to Coles, White King, and to parents like you. Little Sally must be so pleased. I’m sure Little Sally will be fine if mummy and daddy have a brain and keep it in a child proof cupboard and properly capped. Coles has played this exceptionally well. The rest of you whingers, take note – this is what commercial success looks like. Do you complain about Lego being plastic too? Except Lego has a proven long term use. I know people who still have their parents’ lego collections. These will go out of fashion in a matter of weeks. This was done 4 years ago by New World supermarket in NZ and I’m pretty sure they got the idea from a supermarket in Europe who did it earlier. This idea doesn’t belong to Coles. They did the same in a Swiss supermarket 4 or 5 years ago. Also in South Africa 2 years ago with similar branding and some of the same products. The promotion is by a company called UNGA based in Amsterdam who license loyalty programs for a variety of retailers. Woolworths were the first to bring this idea to Aus with their ‘Animal Cards’ collection and will no doubt be looking at their next ‘collectable’ program. Promotion launched the same time Coles backflipped on their plastic bag ban. Coles copped an absolute hammering about creating even more single use plastic products. Totally damaged their brand. I along with many others no longer shop at Coles. But sure you keep spending that extra $2 on chocolate bars so you can unwrap a little toy. Natural selection at it’s finest. It damaged their brand with a vocal minority on social media, who have probably gone back to complaining about Trump by now. Coles’ results speak for themselves. Agreed – the only ‘noise’ I saw about this promotion was negative. I know I live in my inner west bubble, but this campaign is a foul thumbing of the nose to anyone who cares about the environment at all. Correct, you do live in an inner-West bubble. I’d hate to think how many of you work for agencies. You are so disconnected from both mainstream Australia and what drives success for your clients. Speaking as an agency worker from the inner-west, and thank you for the stereotype – I’m glad we’re disconnected from mainstream Australia and have the environment at the forefront of our thinking. We’re more likely to drive our clients to ideas that have positive effects on society and the environment and not execute a hard plastic, viral campaign especially in the midst of a plastic bag catastrophe. It’s a little cringey to see people in the industry commending an existing idea that produced yet another large amount of absolute garbage the kids will get over in a couple of weeks. Great, you keep up the great work driving clients to “ideas that have positive effects on society and the environment”. The grown ups in the room will keep selling stuff. I’m not from the Inner West, but am a parent. I along with many other parents I’ve spoken to are appalled and now refuse to shop at Coles. Not many of these are on social media either and hardly a minority. Perhaps you need to step out of your bubble and wake up to reality? Consumers don’t want plastic. I’m amazed they make tiny little plastic bags to carry them home in. Oh wait. The do come in little plastic bags — silly me. I feel way better about my life after reading this, no matter how crap things were going I’ve never been so low as to get excited about a mini Oak. Really, greatest retail marketing campaign of all time? To me, this campaign seems crass and gimmicky compared to some of the successful campaigns Woolworths ran in conjunction with the Taronga Foundation several years ago (in which you collected endangered animal cards to put in an educational folder). Those campaigns were wildly (pun intended, kind of) successful and generated similar hype in terms of meet ups, Facebook groups etc. Apparently they boosted sales significantly. But they were also educational, interesting and had a valuable social responsibility message around conservation. And far, far less disposable plastic. That all added up to brand building for me – making me feel better about Woolworths. In contrast, Coles’ mini products just seem tacky. I actually feel empathy for Julie here, who has undoubtedly realised her company ‘blog’ needed feeding and rushed out some words to fill the void. There is, of course, no feasible reason as to why anyone could laud this campaign as anything but a trite recycled marketing initiative. The ‘reasoning’ above is naive at best, and lazy at worst. The more interesting point is, of course, why would Mumbrella publish this filler? A more pertinent question would be are 29 comments (maybe 30?) worth demolishing your brand equity for? Good article Julie, you’re dead right – it’s marketing genius. Definitely the best marketing campaign this year. To the naysayers #1 – Bag flip is over. To the naysayers #2 – Who cares if Coles stole the idea! Most marketing ‘ideas’ are copied from somewhere. If I worked for a FMCG brand I’d be pushing hard to get my product in to Coles Little Shop Version 2… which I imagine is already in the pipeworks? It’s probably fair to say that this campaign, and any heralding of it, says everything that needs to be said about what is wrong with some parts of our industry. This would have been ok in 1989. But now? Can’t we do better than pester power and meaningless single use plastic collectibles? The negative aspect of this campaign far outweighs its ability to ‘drive sale’. Profit at all costs is not where our world is heading. We need to think much better than this. According to who? You? I am tipping the shareholders, management, employees and shoppers of Coles all happen to disagree. The Little Shop was a great marketing tool, people I’ve been chatting too want another comeback of these cherished collectibles, me myself included for a 2nd Edition for example our home shopping healthier staples..MINI milk bread meat chicken more fruit/veg to encourage healthier eating. With people moaning about plastic make them bio friendly/recyclabe then?! With every Mini health item collected at time of purchase or with a receipt later should have some sort of a discount for the same product in the next shop. The customer gets something too collect and in return receives something back. Coles still makes the sales customers still shop WIN WIN If this is a too over the top obsurd idea then I’m sorry. I’ve worked in many supermarkets (30+) 20 years… it may work.